Like with all great coffees, the care and passion begins with the farmer. This Honduran El Bambu single plantation is grown in accordance with the 121 Project, a global enterprise scheme helping small scale, micro lot farmers get their coffee into the heart of the industry. This particular coffee is cultivated by Manuel Torres, his farm El Bambu is located in the Copan region of Honduras, which is known for its rich, high quality soils and offers a fantastic landscape. As well as coffee, various other crops grow at the plantation including; Banana, Inga, Pine and Sweetgum. This provides food for the family (who help with cultivation) and allows the beans to be grown in the shade, which increases the total yield. Once harvested, the beans are wet processed for 24 hours – this is a vital maturing process all coffees undergo before they are dried. The outer flesh of the bean is often a by-product however at El Bambu this ‘pulp’ is used to fertilise the soil after harvest. 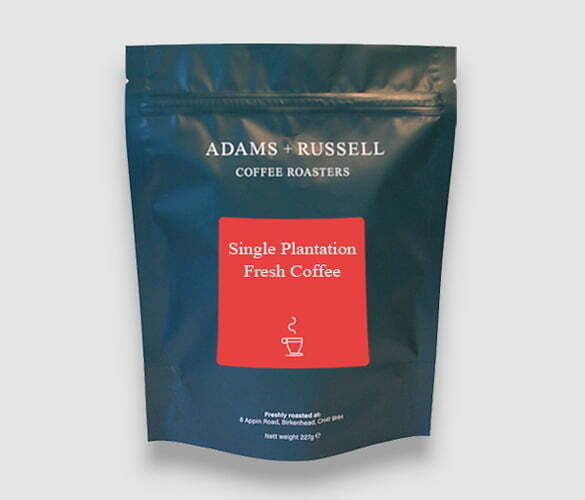 This Adams and Russell coffee is produced in Copan, which is located in the west of Honduras. It is unique because it has such a wide variety of humidity and temperature. When it hits its lowest temperature of roughly 11°C, it can be the coldest producing region in the country. Beans from this region are known through out Honduras for being high quality and delicious. The acidity is bright and piquant, with strong, sweet notes of chocolate and red fruit. The body is rich and creamy, creating a real sense of luxury. Other growing regions in Honduras include Opalaca, Montecillos, Comayagua, El Paraiso and Agalta. We always roast our beans ourselves at our own special roasting house to ensure premium quality. We roast in small batches and our experts watch over them, waiting for the perfect amount of roasting. The beans can reach temperatures over 200°C. We hand pack them in specially designed packaging that allows the beans to release gases, while simultaneously stopping air getting in. This allows for maximum freshness when they arrive at your front door. With a wonderful ripe, red fruit flavour and brown sugar aroma, this coffee is excellent in a cafetiere allowing a subtle chocolate taste to shine through. You know if you like a coffee but it is difficut to explain why. Like our attitude to say a painting, we all have different ideas but we like this coffee. It has that “ohh… that’s a niiiice coffee, shall we have another” personality.